ICS powered phone features a 5 mp camera, keeps both SIMs active at all times; looks almost like the GALAXY S III. Samsung has added a new handset to its lineup of dual-SIM Android smartphones. Dubbed the GALAXY S DUOS, this handset offers a Dual SIM Always on feature that keeps both SIM cards active simultaneously. Fandroids will be pleased to know that the phone runs Android 4.0 (Ice Cream Sandwich) out of the box. 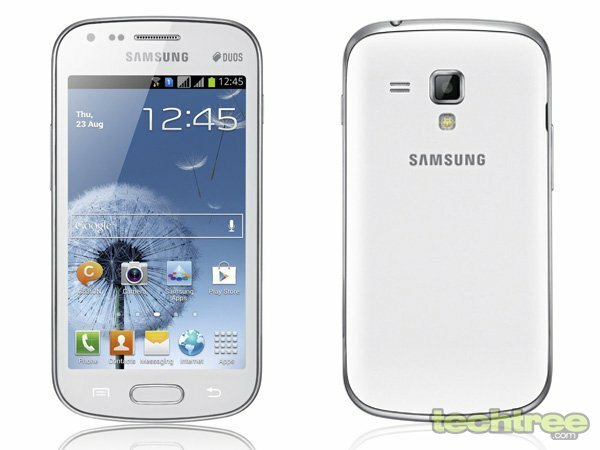 As mentioned in our previous article about the phone's specs being leaked, it looks a lot like the Korean manufacturer's flagship handset, the GALAXY S III. Dual-SIM, dual-active GSM (850 \ 900 \ 1800 \ 1900 MHz), dual-band 3G (900 \ 2100 MHz). 1 GHz CPU, RAM not specified. 4.0" WVGA TFT LCD with pixel dimensions of 480x800 (233 ppi). 5 mp auto-focus rear camera with LED flash, front VGA camera. Bluetooth 3.0, Micro-USB 2.0, Wi-Fi, Assisted GPS. Supported Audio: MP3, AAC, AAC+, eAAC+. Supported Video: MPEG4, H.263, H.264; 480p playback and recording at 30 fps. 3.5 mm audio jack, Stereo FM radio with RDS. 2.5" (w) x 4.8" (l) x 0.4" (10.5 mm) (w), 120 grammes. The GALAXY S DUOS comes pre-installed with the ChatON app, which is Samsung's version of BBM (BlackBerry Messenger). The handset is priced at and MRP of Rs 18,000. However, it is not available in online stores as of this writing. For more product shots, check out the gallery below. When we had asked your opinion about a fair price for this phone, many readers had chosen Rs 15,000 as their answer. Does the phone's dual-active SIM feature justify a premium of Rs 3000? Let us know in the comments.